This painting testifies to the growing enthusiasm for fly fishing during the 19th century (paintings of fish in landscape settings – e.g. by Henry Rolfe – became popular, as did more culinary still life studies by artists such as Manet and William Merritt Chase). It is an interesting choice of subject for a woman painter, who might have been expected to opt for the more conventional ‘female’ genres of flowerpieces, interiors, or portraits of women and children. All the accoutrements of the fly fisherman are portrayed: the creel, bag and reels, as well as the brilliantly coloured materials used to create the flies. The pile of books on the right-hand side, beneath the album, may include F.M. Halford’s best-selling Floating flies and how to dress them, published in 1886 and containing 90 hand-coloured engravings ‘of the most killing patterns’, and the whole is presided over by the engraving after Jacob Huymans’s portrait of Izaak Walton (The Compleat Angler). Catherine Wood was an painter of considerable skill, as witnessed by her long career exhibiting in the R.A. and elsewhere, and the appreciation of her work by artists such as Sickert. This is a masterly and colourful example of her work, in which an apparently random arrangement of items is revealed as an expertly composed scene, creating an almost abstract pattern of form and colour across the canvas. 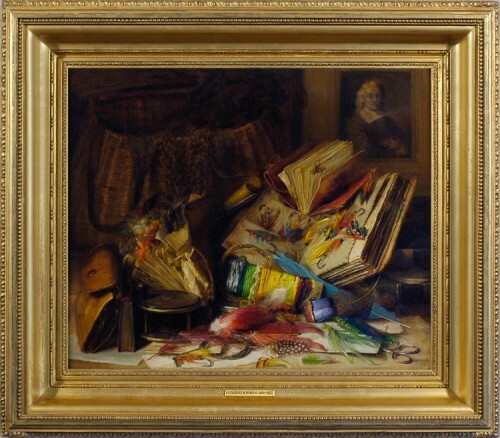 The delicacy and painterly qualities for which she is known appear at their most descriptive in this extremely rare work (for whilst there are many still life paintings of dead fish and angling equipment, studies of the fly-tieing process are so uncommon as to be almost non-existent). Catherine Morris Wood was born in Islington in 1857 to a London barrister and a Scottish mother. In 1879 she won a scholarship to the Royal Female School of Art (since incorporated into Central St Martins). She was talented and prolific, exhibiting at the Royal Academy from 1880, when she was 23, and continuing to show her work there for more than forty years. She also exhibited at the New English Art Club, the Royal Society of British Artists, and the Walker Galleries, and was elected a member of the Society of Women Artists (until 1872, the Society of Lady Artists: see quote below), the Royal Institute of Painters in Oils and the RBA, Suffolk Street. Her skill caught the eye of Walter Sickert, who reviewed ‘The exhibition of Lady Artists in the Drawing-room Gallery of the Egyptian Hall’ (New York Herald, 27 March 1889). Having excoriated the usual ‘same strips of canvas or paper painted by people who ought never to paint’, he picks out ‘ ‘Strawberries and Cherries,’ by Catherine N. [sic] Wood, [which] is just about as perfect as they make them. No. 211 reminds me in its smart juiciness of Mr Ludovici’s flower-pictures’ . In 1892, at the age of 35, Catherine married the watercolourist Richard Henry Wright of Hampshire, who painted primarily architectural and landscape subjects. Catherine specialized in still life and genre subjects, but as well as the approved subjects for Victorian female painters – flowers, fruit, interiors of rooms, etc. – she also produced more ‘male’ subjects (gamepieces, a still life of pipes and others of books and papers). Her husband died in 1930, and Catherine herself may have followed him in 1939, after which she can no longer be traced. Works in public collections include The church of St Etienne, 1911, Manchester City Art Gallery.